But a girls night out at a bar downtown seemed like the perfect time to try tapas for dinner at Estrellon. We got one of the last tiny tables on the tapas side of the restaurant and after waiting a little too long for a waiter, we ordered a half dozen tapas to start with. But those ended up being surprisingly filling and a perfect mix of fun food for dinner. The deviled eggs were too mustardy for me…I like my deviled eggs traditionally chocked full of mayo. This was the worst thing we got. I’m not sure what I was expecting because the menu didn’t say fried cheese curds, but fresh cheese curds (that weren’t even squeaky so they couldn’t have been that fresh) with some dressing and sesame seeds on top was a very underwhelming dish. Definitely not worth ordering. The toast pieces come with a bunch of different topping options. I got the summer sausage with raw milk cheddar and pickles; the charred beets with manchego cheese and pine nuts; and the jamon iberico with tomato jam and relish. My friend got the sweet pears with candied walnut butter and feta cheese; brie with artichoke, tomato and caviar; and the smoked sockeye salmon with greek yogurt, caviar and truffle honey. They were a lot smaller than I expected, but they were extremely tasty. My favorite was the summer sausage one with the housemade pickle! These were the best thing we ordered. They were fried mushrooms, but what made them special was that they were stuffed with cheese and came with a great aioli sauce drizzled on top. They were hot, crispy and had a great flavor. And since the cheese and sauce were so rich, the serving size was just enough. These were pretty much what I expected — crunchy, salty frites with yummy aioli. I always go for papas fritas because they’re easy to do well. Always a good standby. FOOD NOTES: Once we got everything we ordered, we decided we wouldn’t need another round of food, which was good. Our bill (split two ways) ended up being about the same as if we had gone to another pricier restaurant downtown, which was pleasantly surprising. After we listed off our entire order, I thought it was going to be about double what it ended up being. Estrellon is definitely a fun place to go, and if you drink wine they have a happy hour deal where you buy a glass of house wine and get a free tapa…which would be a great way to check out Estrellon. 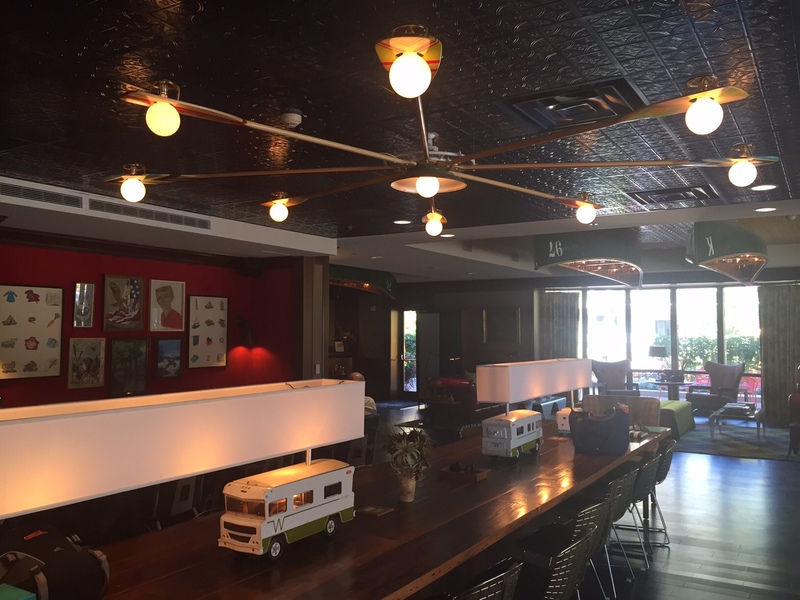 The amount of food and beverage options downtown keeps growing, but there are always some standouts. 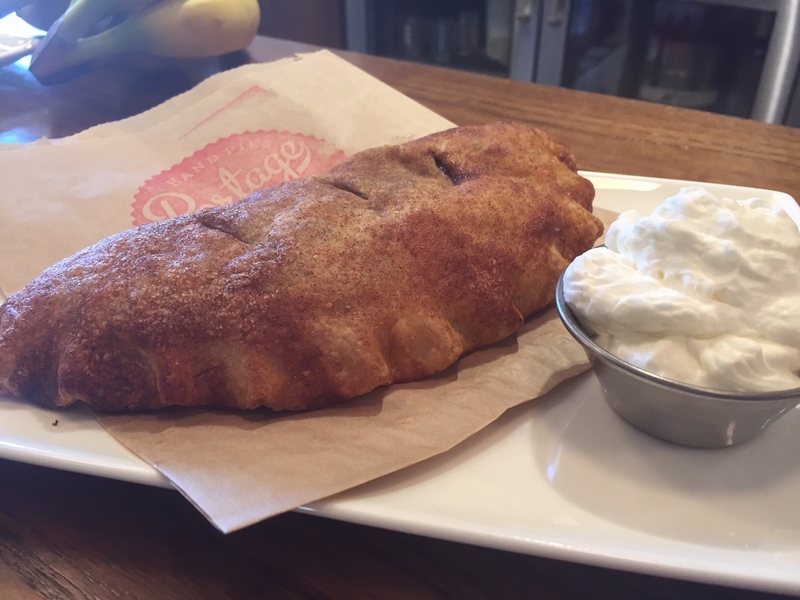 Over the summer about a dozen new places opened downtown, but one place’s atmosphere, location and food should be noticed. 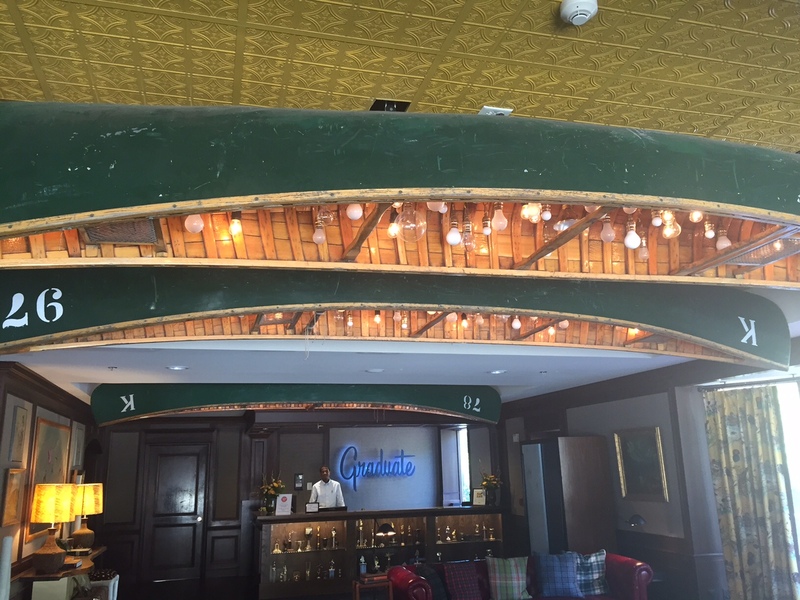 Portage Pi is in the lobby of the new Graduate Hotel on the corner of Francis and Langdon streets. 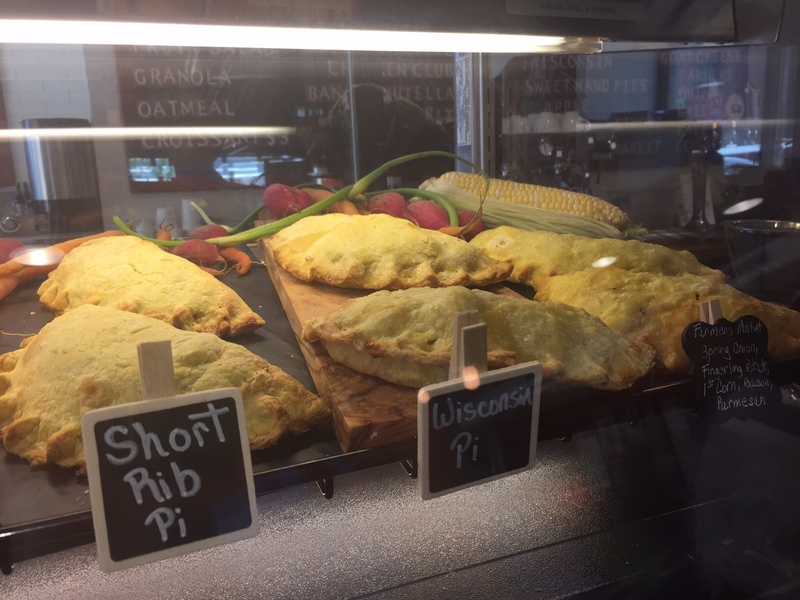 It’s the perfect location for students needing sustenance either walking to or from classes, but students shouldn’t be the only people enjoying this new gem. 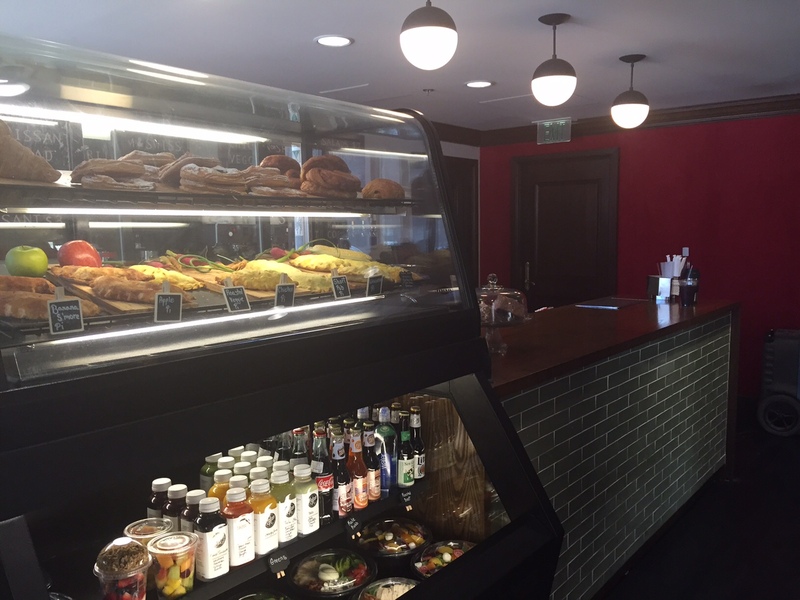 When I visited with my friend Michelle Li, they said they’d be opening a cafe and walk-up counter for quick ordering. But if you walk up, you don’t get to experience the great decor and atmosphere inside. I’m not really sure how to explain the decor, other than saying there’s probably something for everyone. 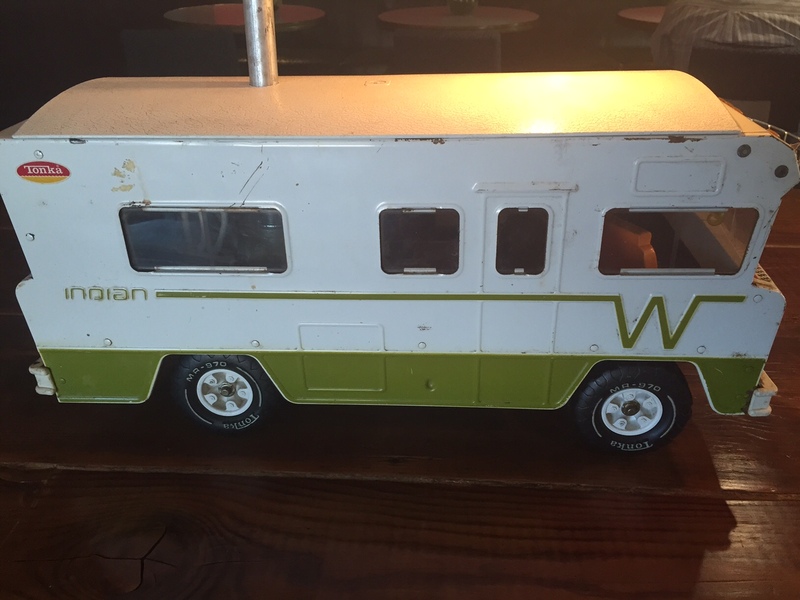 It’s cute, eclectic, cozy and has some local flair. The menu has hand pies, salads, sandwiches, coffee, smoothies and juice. 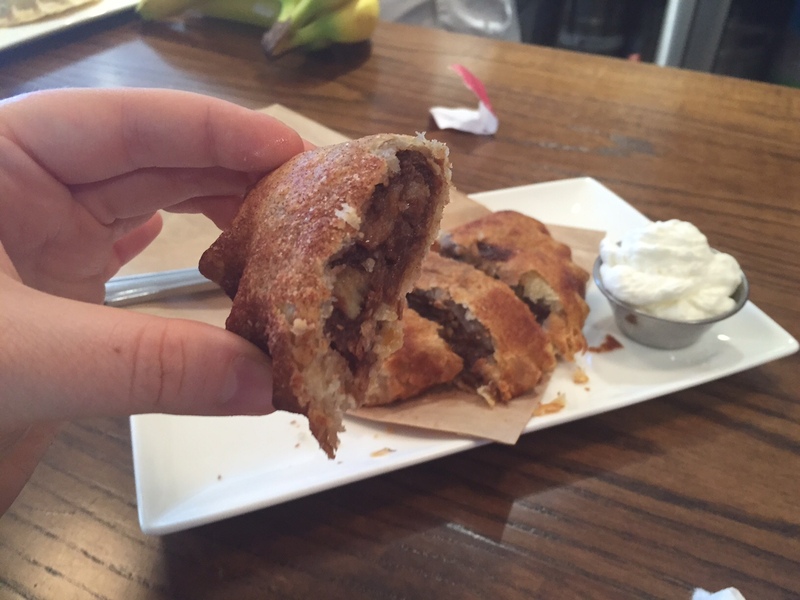 We got to try two of their hand pies — the banana s’mores pie and the short rib pie. 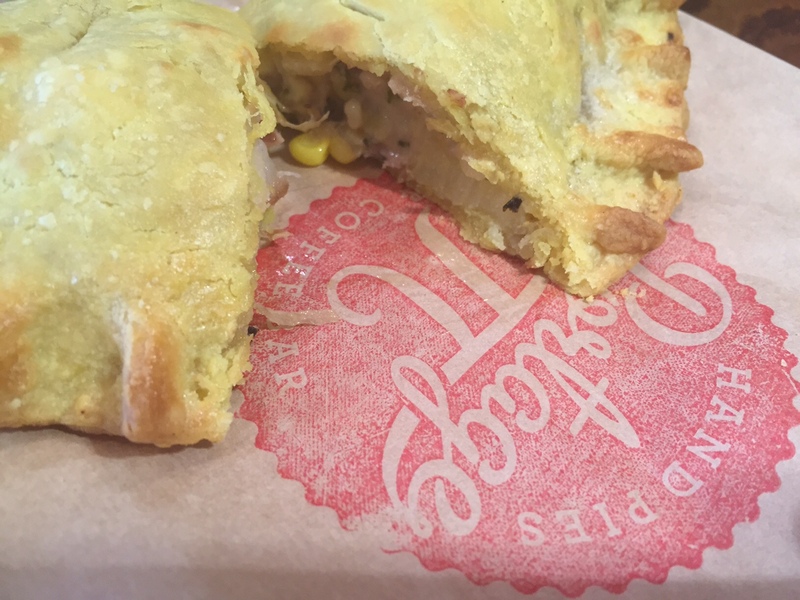 Both hand pies were super good, but I liked the savory one better. They would be great to take to class and secretly eat in the back row of a lecture hall! The crust was flaky and didn’t overwhelm the filling. 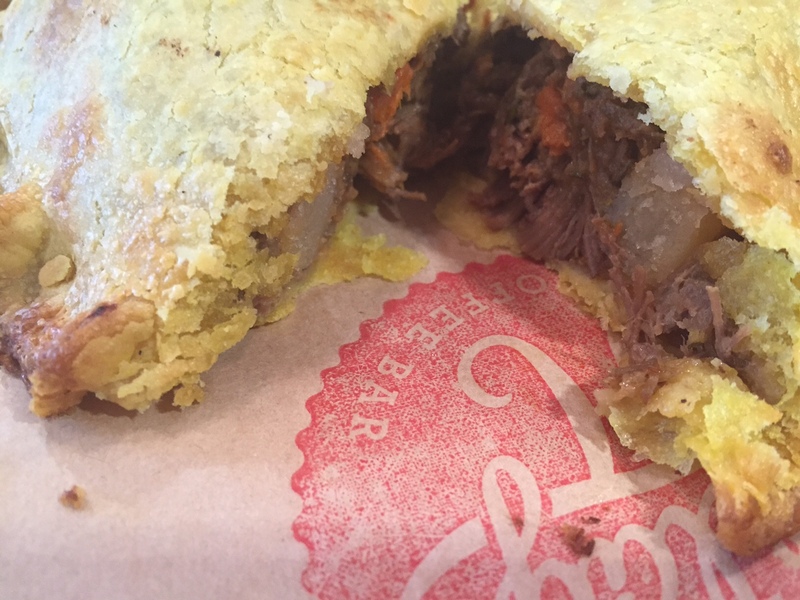 The inside was flavorful and filled with quality ingredients. The banana s’mores pie was also good, but unless you’re a huge dessert fan, I wouldn’t pass up the savory pies for the dessert pies. They are a bit too sweet for my taste. I also got to try one of their housemade juices — the Thornton Melon with honeydew, mint, lemon, ginger and cucumber. 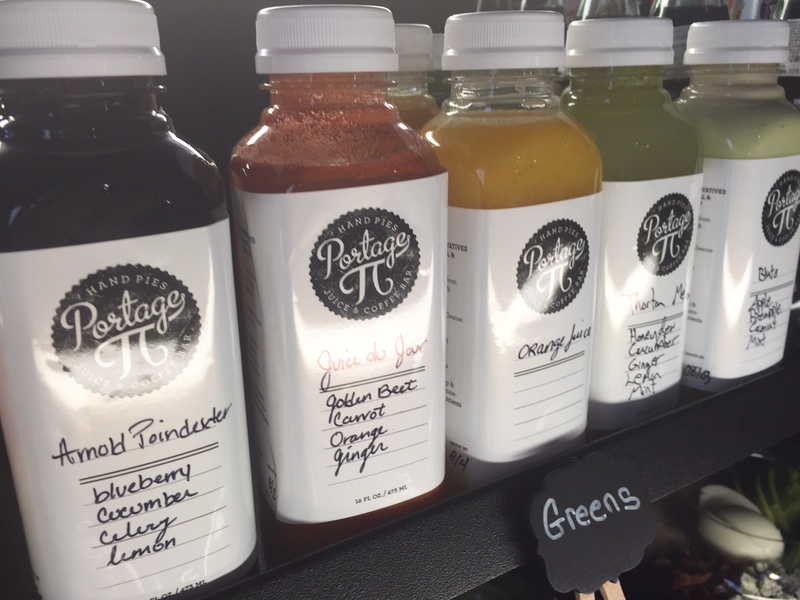 It was super refreshing and even though it was technically juice, didn’t feel sugary…it tasted like infused water. FOOD NOTES: I lived three blocks from this place when I was in college and it would have been a regular stop on my way back from class. 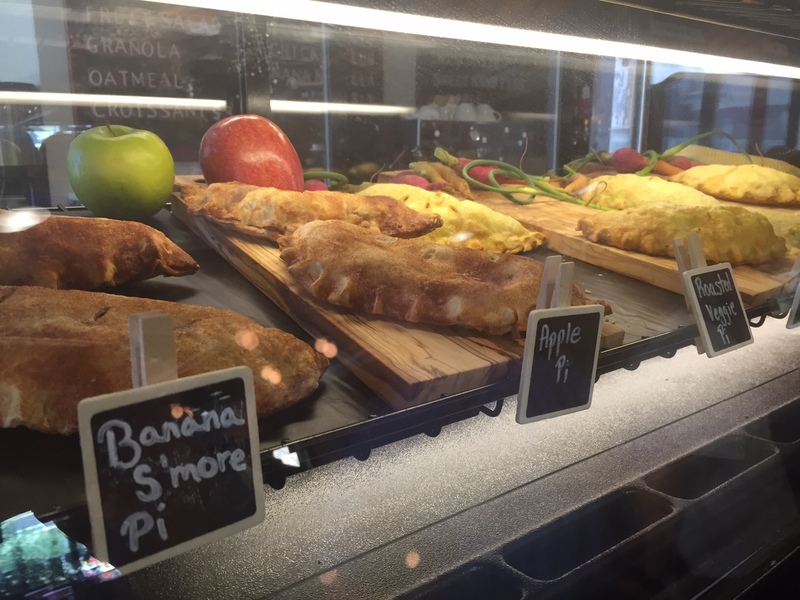 A place where I can get good coffee, a quick lunch and a juice or snack for later would have been at the top of my list of regular stops…right up there with Med Cafe, Amy’s and Chipotle. I wouldn’t recommend getting the juices every day, but it would have been a good treat on some of those hot days at the beginning of the school year. My experience with Italian food growing up included pasta from a box and sauce from a can, the famous blue-box mac and cheese, and something called “Italian ice” that probably isn’t actually Italian. I’ve tried to expand my exposure to real Italian food, but my options have been limited. That is…until Cento opened in downtown Madison. I had heard mixed reviews before my first trip at the end of April, but my pre-concert dinner with a friend was fantastic! The menu is broken into appetizers, small plates, soups/salads, pizza and pasta. The pasta comes in two sizes, which means you can get three appetizers or small plates and a small pasta — which is what my friend and I did! We started with melon and prosciutto which is something I’ve never had. 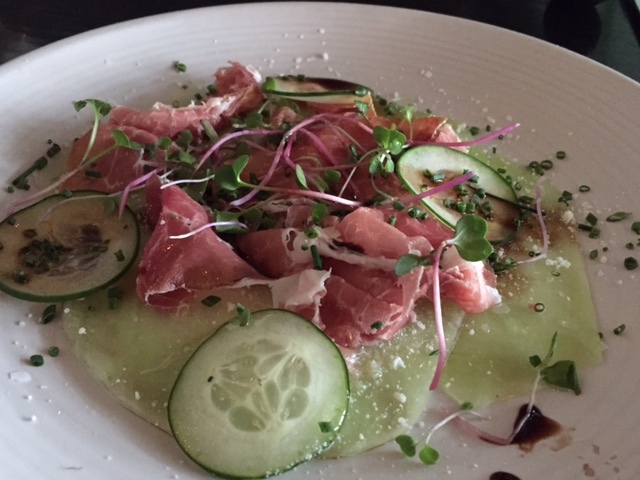 It was thinly-sliced prosciutto and honeydew melon with sliced cucumber, balsamic glaze and parmesan cheese sprinkled on top. This is not a dish that sounds good when you read the description, but the combination of the sweet, light melon and the salty prosciutto really works well together. The balsamic adds a much-needed kick of acidity, and if I’m being honest — I don’t even remember tasting any parmesan cheese over the other strong flavors on the plate. 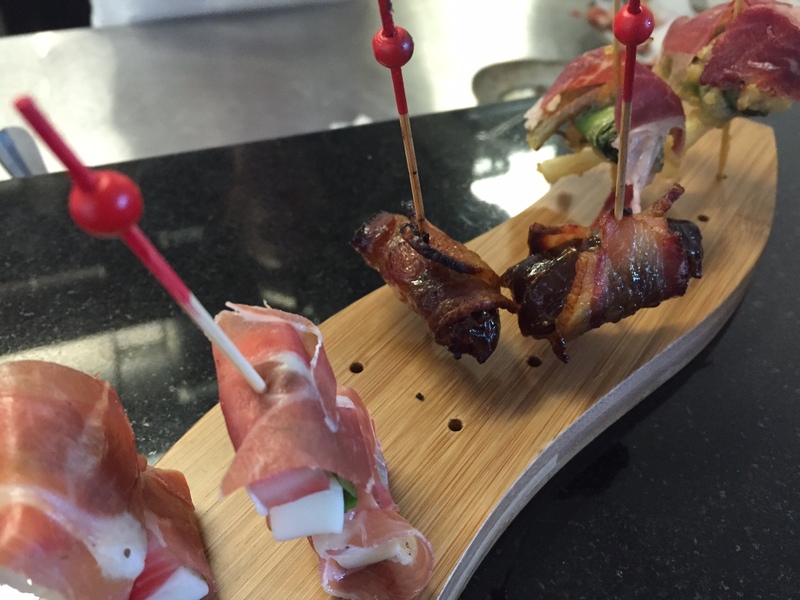 The second appetizer/small plate we got was bacon wrapped dates. I usually avoid these at restaurants because they’re usually stuffed with goat cheese and I don’t like goat cheese. 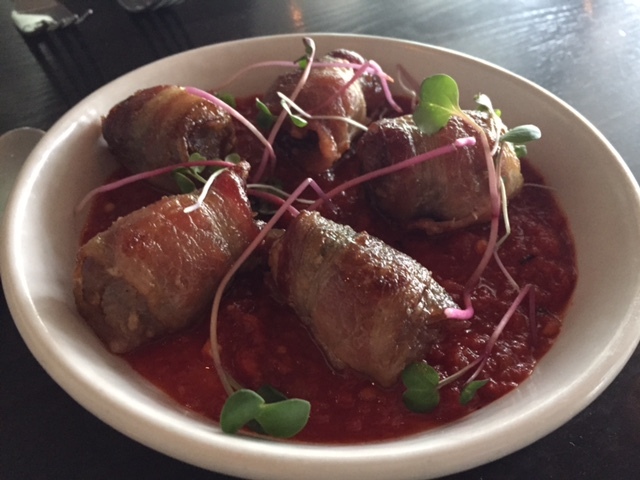 But these were stuffed with spicy sausage…and let me tell you, spicy sausage in a sweet date wrapped in bacon…it really couldn’t get better than that! The combination of spicy, salty and sweet was super good. More restaurants should stuff their bacon wrapped dates with spicy sausage instead of goat cheese! The third appetizer/small plate we got was my favorite — and it’s not just because I first heard about them on the “Sopranos.” Arancinis are rice balls stuffed with cheese that are coated with breadcrumbs and then fried. They sound super boring, but they are great! 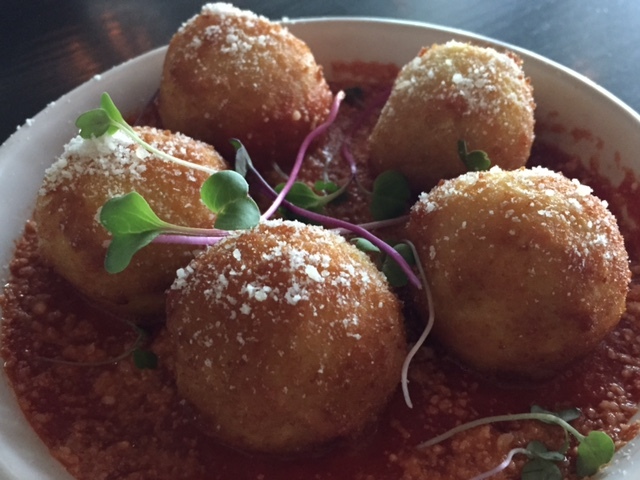 Cheesey fried rice balls in marinara sauce — yum! When deciding on an entree I went for pasta because I’m not a huge fan of pizza and the pasta are made fresh. 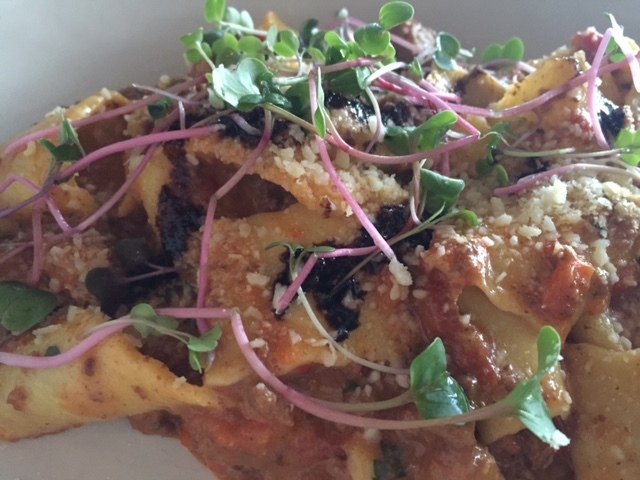 I went with the pappardelle that comes with a “northern ragu.” I’m not sure what “northern” means but it was very rich and flavorful and the noodles were excellent. There’s something special about fresh pasta…it’s hard to describe, but once you’ve had it you know the difference. 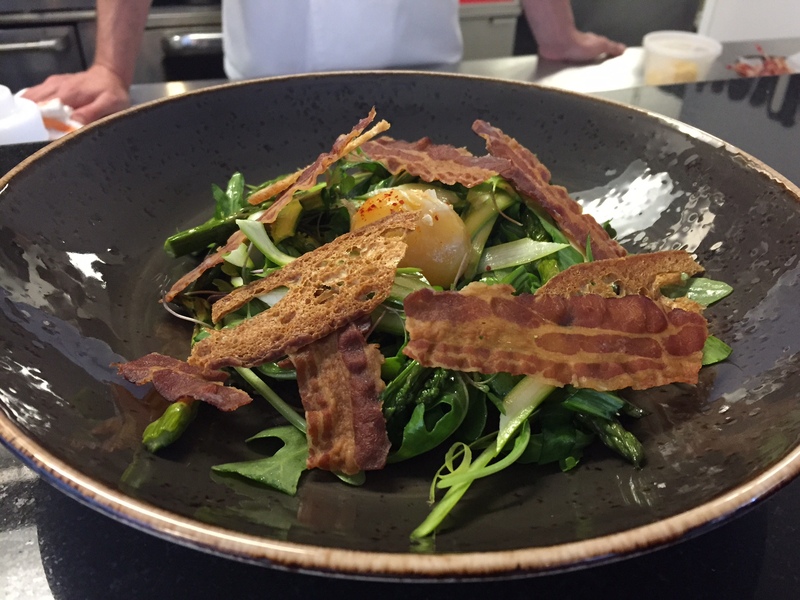 As much as I loved our starters…I liked my pasta better! We weren’t going to get dessert, but the cheesecake sounded so good we couldn’t resist. 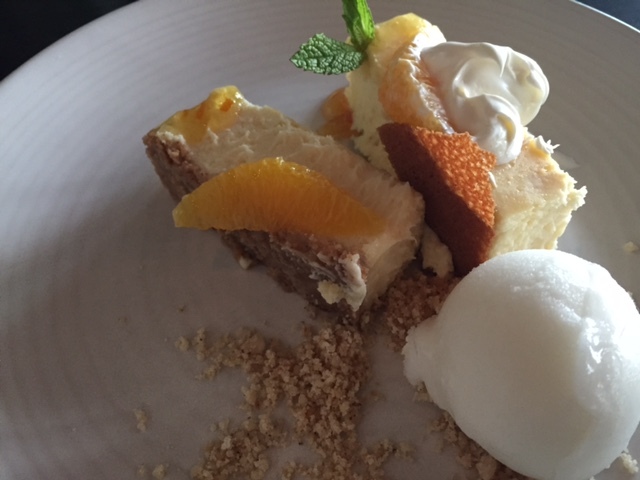 Everything about the cheesecake was perfect, except the marmalade and the lemon sorbet. The cheesecake was rich and creamy. The crust was sweet and crumbly. The cream on top was light. The slices of orange added a great freshness and the crispy sugar was fun. The other two components of the dessert were unnecessary and slightly unpleasant. We completely ignored the thick orange marmalade and we probably should have done the same with the sorbet. It was extremely bitter…to the point that it was unpleasant to try and eat. But once those were pushed off to the side or scraped off…the cheesecake dessert was great! 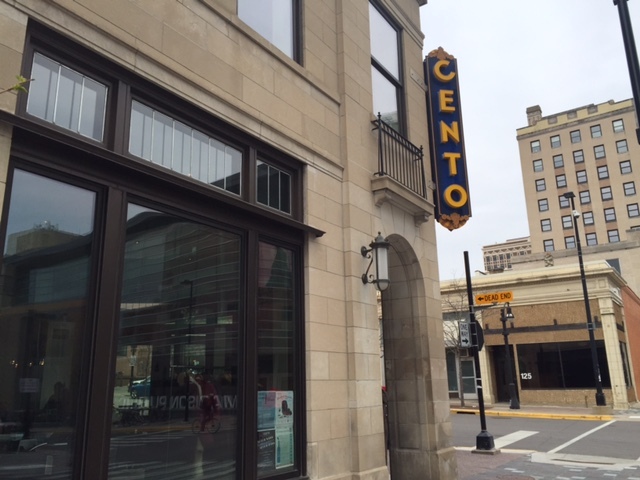 FOOD NOTES: Cento is a great addition to the Food Fight network and to the downtown restaurant scene! Not only did we have a great time figuring out what all the authentic Italian stuff on the menu was, but we also had a great meal. 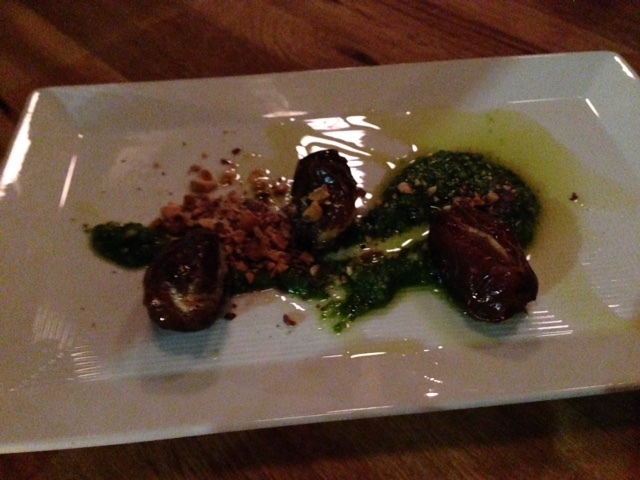 The arancini are a must when ordering a starter and the bacon wrapped dates should also be considered. After finishing off our three starters I was so full…but my pasta was so good I couldn’t stop eating it! Fresh pasta is really one of the best things an Italian restaurant can do to set itself apart. Next time I want to try their burrata, cheese board and their potato gnocchi. 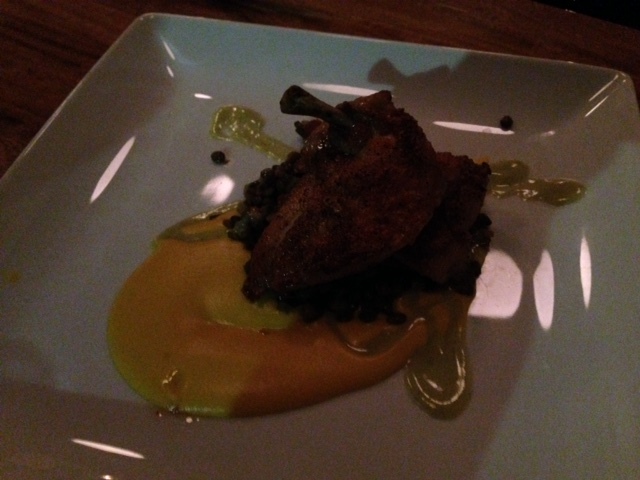 My third Restaurant Week stop in January was at 43 North on King Street. 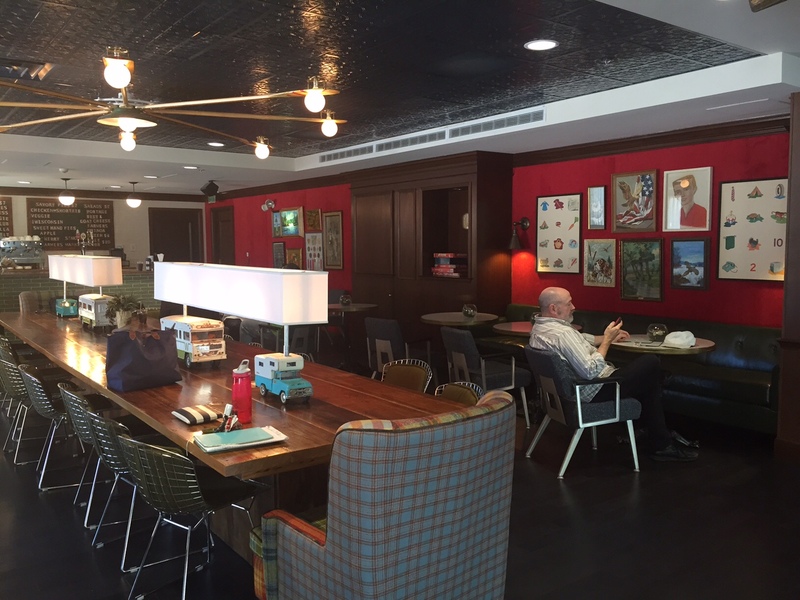 Based on their normal menu, the tiny “modern bistro” features classic appetizers, salads and entrees with modern twists (different sauces, interesting ingredient combinations). But I’ve learned that anything with the word “bistro” in the description usually means the portions are small and 43 North was no exception. Usually the point of small dishes is that the flavor makes up for the size, but that was not the case with the dishes I tried at 43 North. **NOTE: sorry about the bad pictures…it was super dark in there! For appetizers they were offering a radish salad, roasted dates with goat cheese and a sweet potato soup, which is what I got. 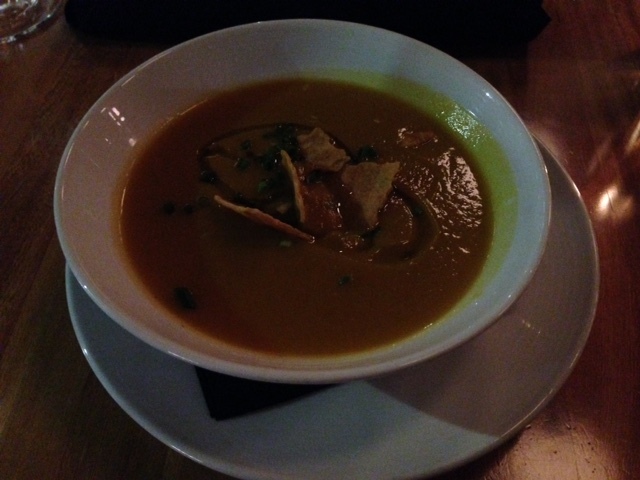 The soup was smooth, but not creamy and didn’t have any complex flavors. It just tasted like savory sweet potato puree. To be honest, it almost tasted like it had curry in it, but that was not in the description. It was not memorable. The entree options seemed to have more components. The two friends I went with got game hen with lentils, thyme vinaigrette, bacon and butternut squash, and curried cauliflower with polenta, kale and eggplant. The curried cauliflower had a very light (almost nonexistent and less than the sweet potato soup) curry flavor. 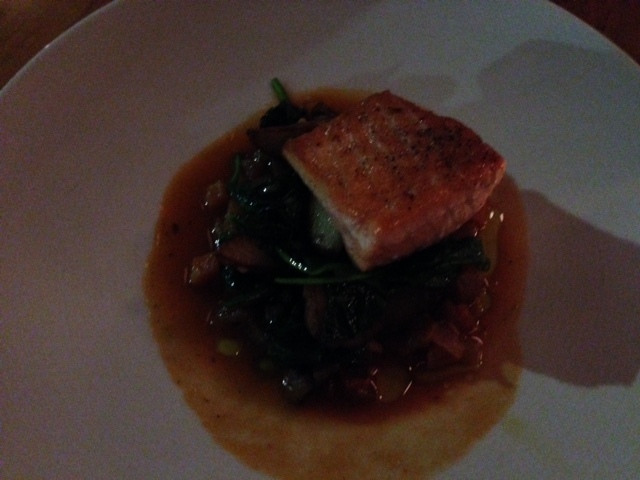 I got the salmon with red potato, spinach and mushroom ragout. I will use two words to describe the dish: small and boring. My salmon was cooked well and was crispy on the outside, but it was the absolute smallest piece of fish I have ever been served at a restaurant. 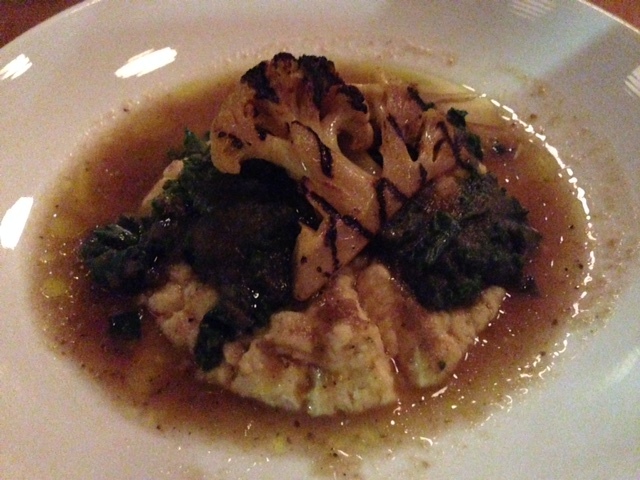 The spinach was unremarkable and the mushroom ragout was lacking the savory flavor I expect from mushroom sauces. The red potatoes were mixed in with the mushroom ragout, so I can’t imagine they had any great flavor on their own. The dessert options actually sounded the most exciting. They offered a Wisconsin cheese platter with jam and mustard (but the cheese options were a blue cheese and goat cheese — why not offer a cheddar?) and a very interesting dessert called a Pavlova. After some research we learned it is a meringue-based cake with a crisp crust and usually topped with fruit and whipped cream. 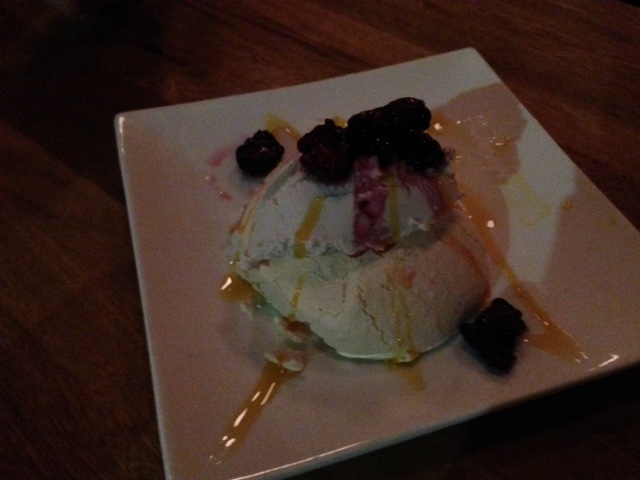 The Pavlova at 43 North came with coconut cream, blackberries and passion fruit coulis. It looked very interesting, but because of the coconut I didn’t try it. I got the almond panna cotta with balsamic macerated strawberries and hazelnut shortbread. 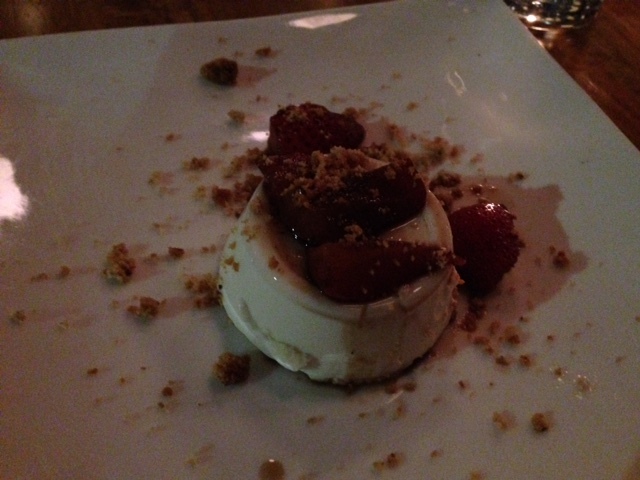 The panna cotta was light in texture, but had a dense vanilla-y, almond flavor. The panna cotta by itself was the single best part of my meal. The toppings were a little odd. The balsamic macerated strawberries just tasted like cooked strawberries…I was missing the sweet tang I was expecting from the balsamic vinegar. The hazelnut shortbread was hard to identify. I was expecting it to be a cookie or larger chunks, but it was basically crumbles on top that I kept trying to scoop up. I’m not sure what the hazelnut shortbread tasted like because I could never get enough in one bite to get a good sense of its flavor. 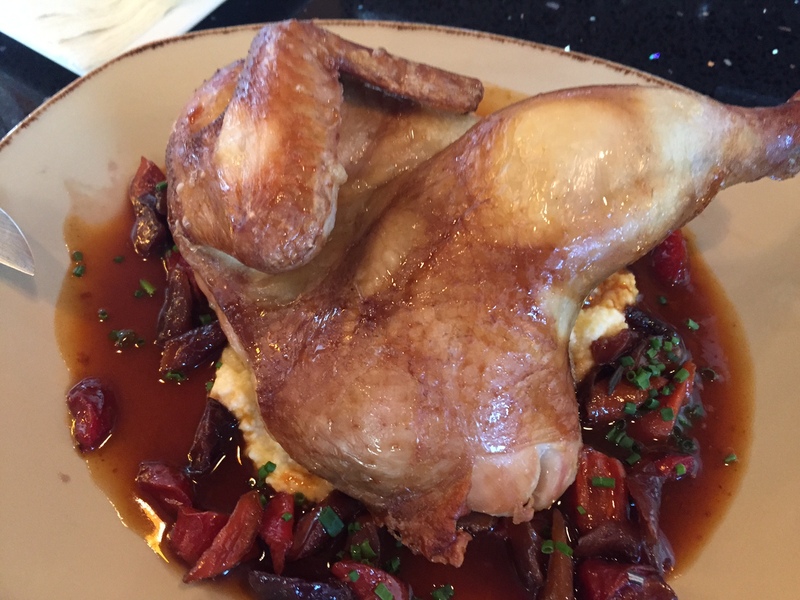 FOOD NOTES: All in all, I was pretty disappointed with my meal at 43 North. The soup was lacking in flavor. The salmon dish featured a perfectly cooked piece of fish, but everything else on the plate was bland. The dessert was the best part, but only the panna cotta. The toppings followed suit with the rest of the meal — boring flavors and small amounts (why does a hazelnut shortbread have to be mashed into minuscule pieces instead of served in larger, edible chunks?). I’m glad I finally got to try 43 North (especially during Restaurant Week when I didn’t shell out a ton of money), because now I know it belongs on my “do not visit” list.